Oracle Bones – Priests would write questions from the rulers on sheep or goat bones. The bones were heated and cracked. The priests would then interpret. 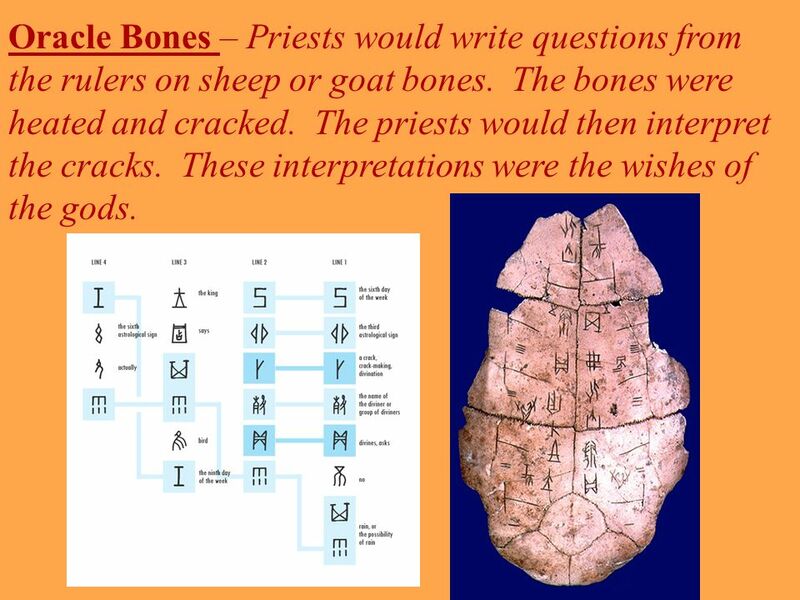 3 Oracle Bones – Priests would write questions from the rulers on sheep or goat bones. The bones were heated and cracked. The priests would then interpret the cracks. These interpretations were the wishes of the gods. 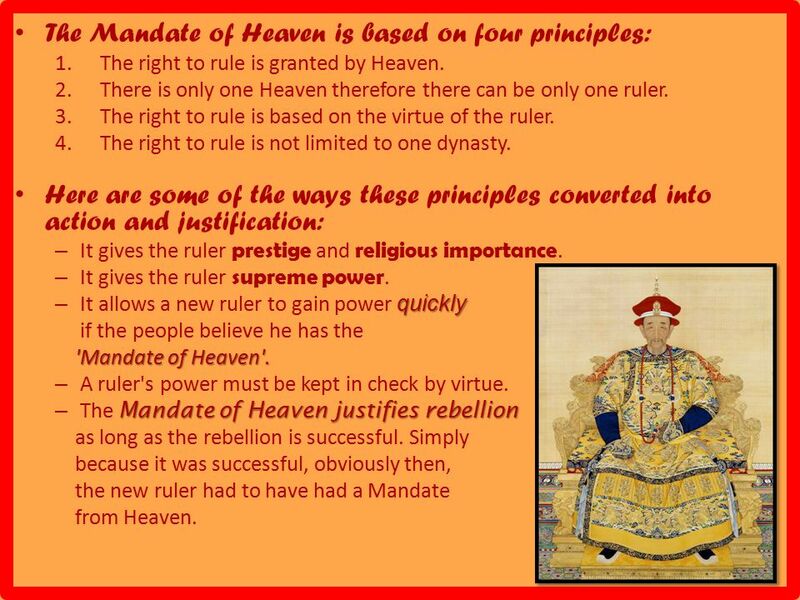 5 The Mandate of Heaven is based on four principles: 1.The right to rule is granted by Heaven. 2.There is only one Heaven therefore there can be only one ruler. 3.The right to rule is based on the virtue of the ruler. 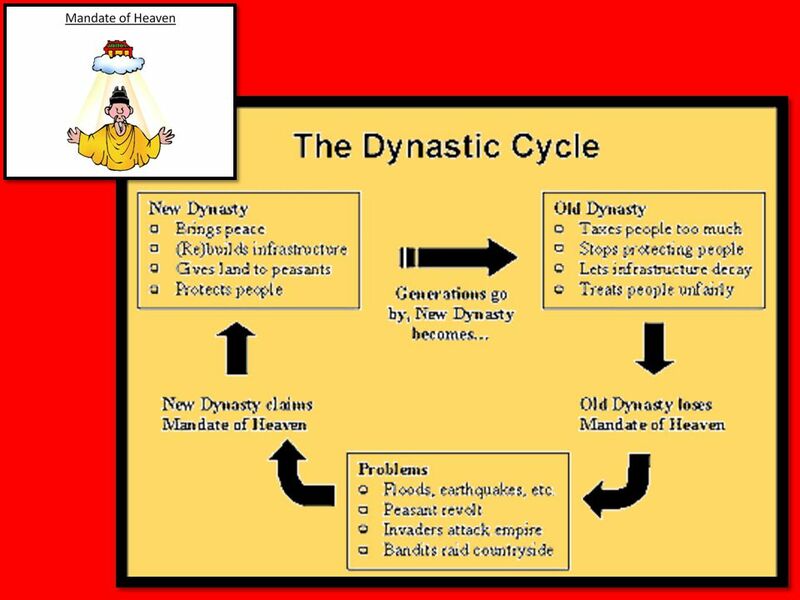 4.The right to rule is not limited to one dynasty. 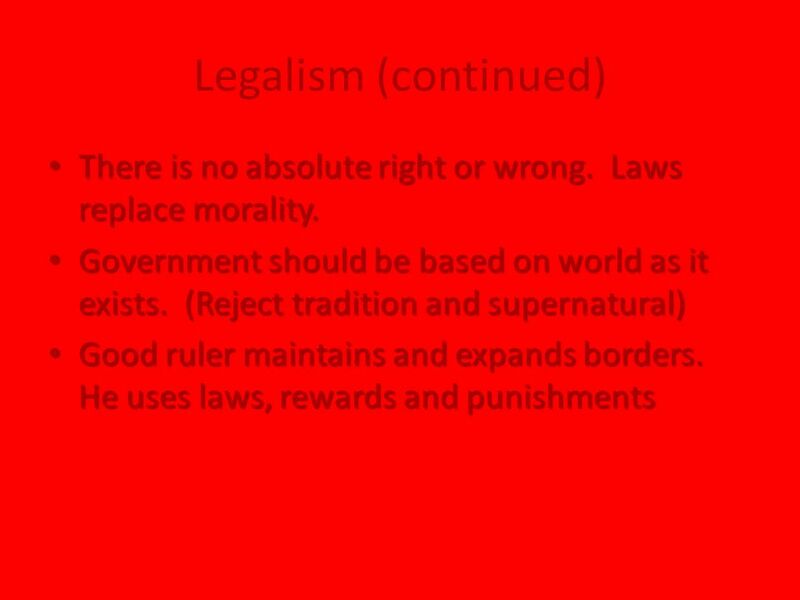 Here are some of the ways these principles converted into action and justification: – It gives the ruler prestige and religious importance. – It gives the ruler supreme power. 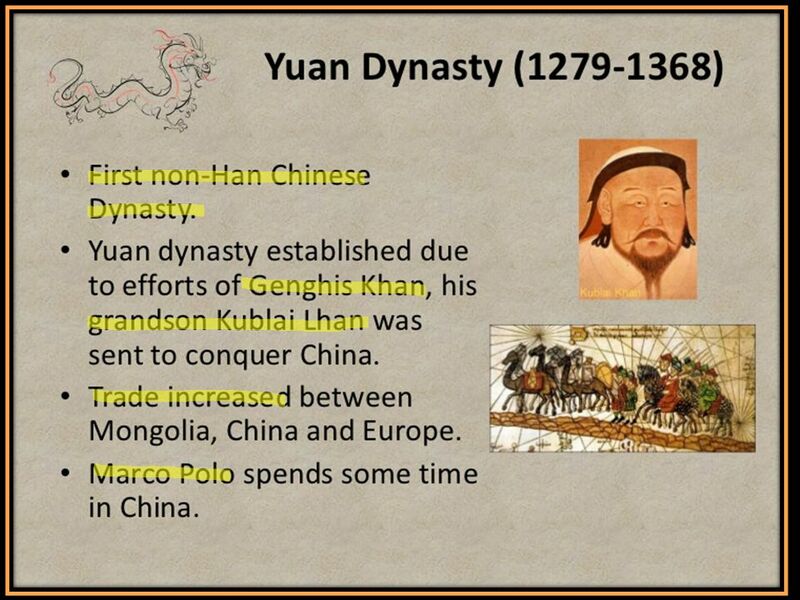 quickly – It allows a new ruler to gain power quickly if the people believe he has the 'Mandate of Heaven'. 'Mandate of Heaven'. – A ruler's power must be kept in check by virtue. Mandate of Heaven justifies rebellion – The Mandate of Heaven justifies rebellion as long as the rebellion is successful. 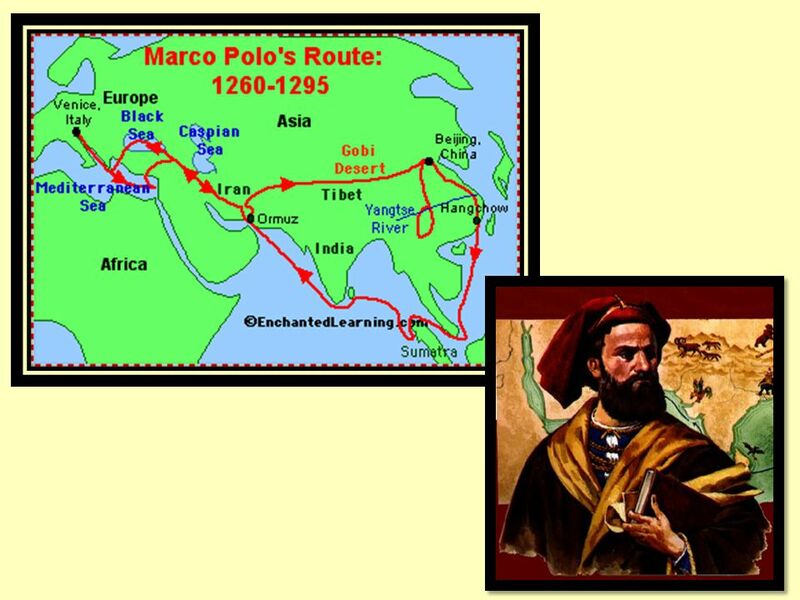 Simply because it was successful, obviously then, the new ruler had to have had a Mandate from Heaven. 10 Kong Fuzi lived 551-479 BCE Kong Fuzi lived 551-479 BCE A time of warfare and unrest A time of warfare and unrest Focus: The Importance of How People Relate to One Another Focus: The Importance of How People Relate to One Another Education overcomes ignorance Education overcomes ignorance People are good People are good Ideal ruler is an educated, moral person who guides society by good example. Ideal ruler is an educated, moral person who guides society by good example. 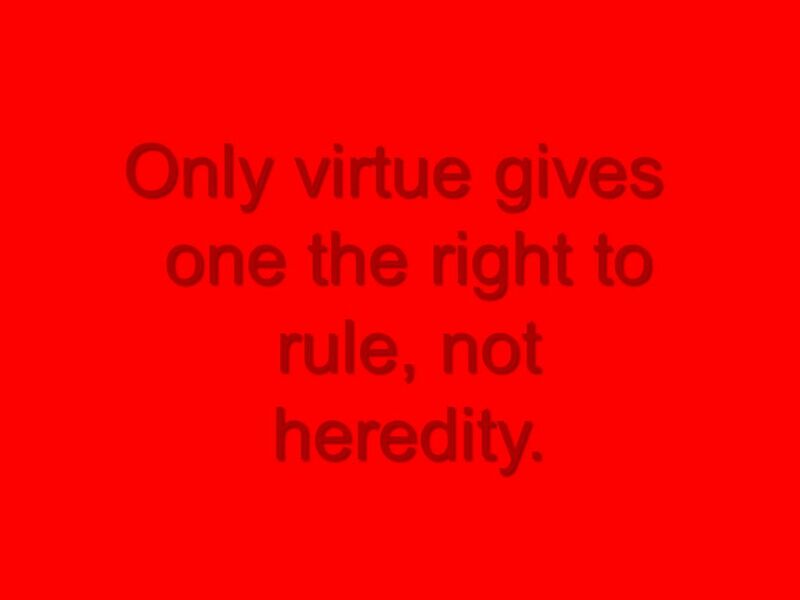 15 Only virtue gives one the right to rule, not heredity. 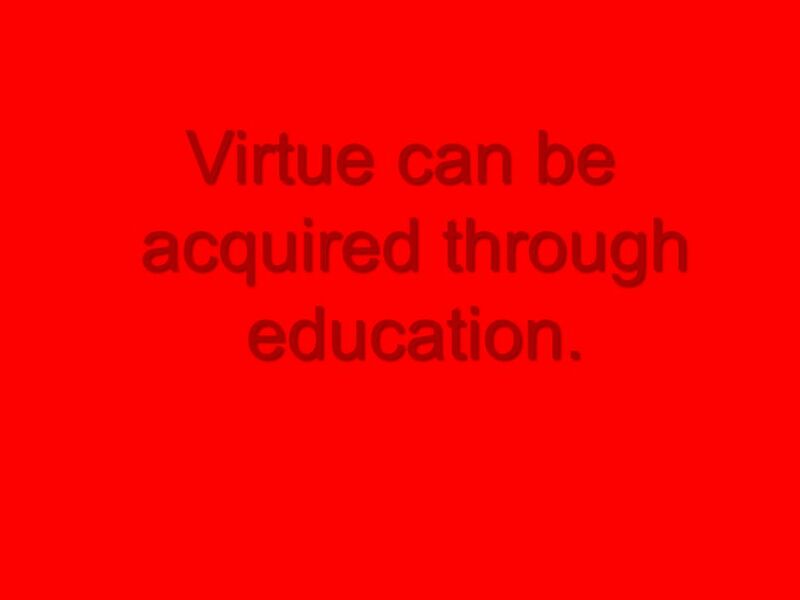 16 Virtue can be acquired through education. 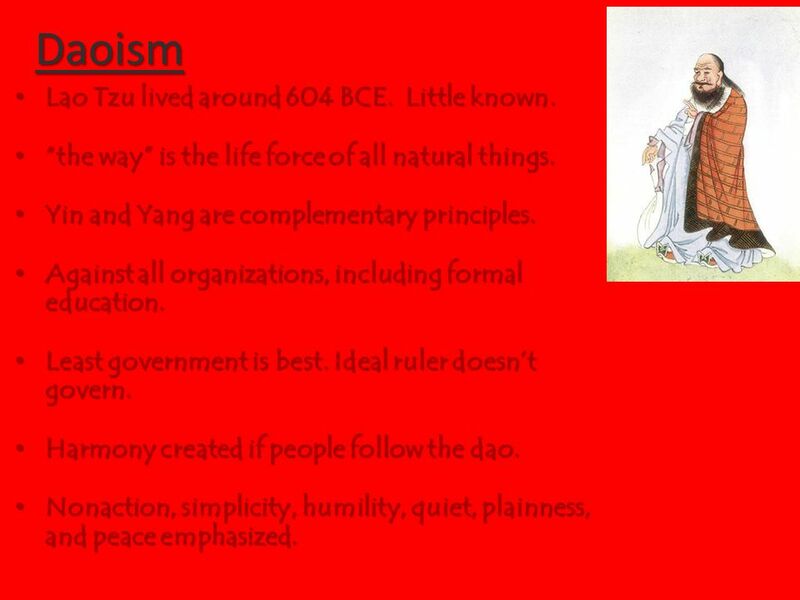 17 Daoism Lao Tzu lived around 604 BCE. Little known. 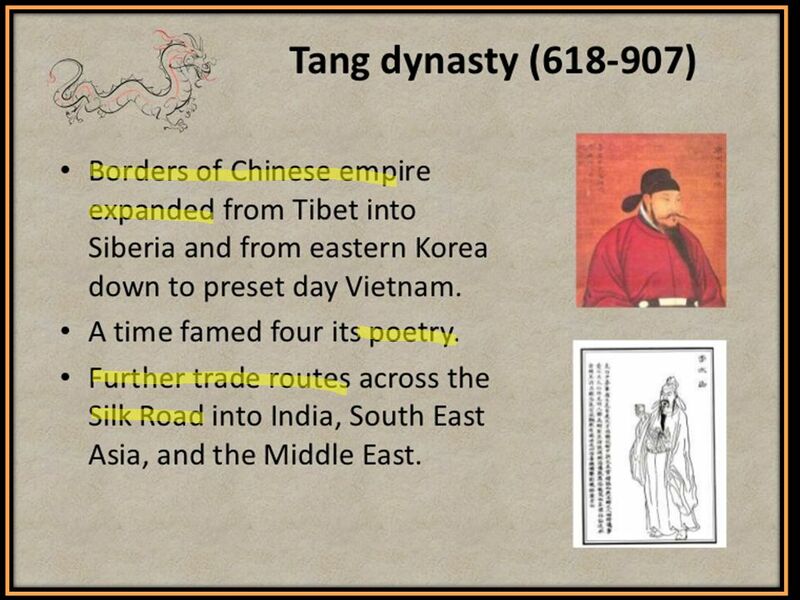 Lao Tzu lived around 604 BCE. Little known. “the way” is the life force of all natural things. “the way” is the life force of all natural things. Yin and Yang are complementary principles. Yin and Yang are complementary principles. Against all organizations, including formal education. Against all organizations, including formal education. Least government is best. Ideal ruler doesn’t govern. Least government is best. Ideal ruler doesn’t govern. Harmony created if people follow the dao. 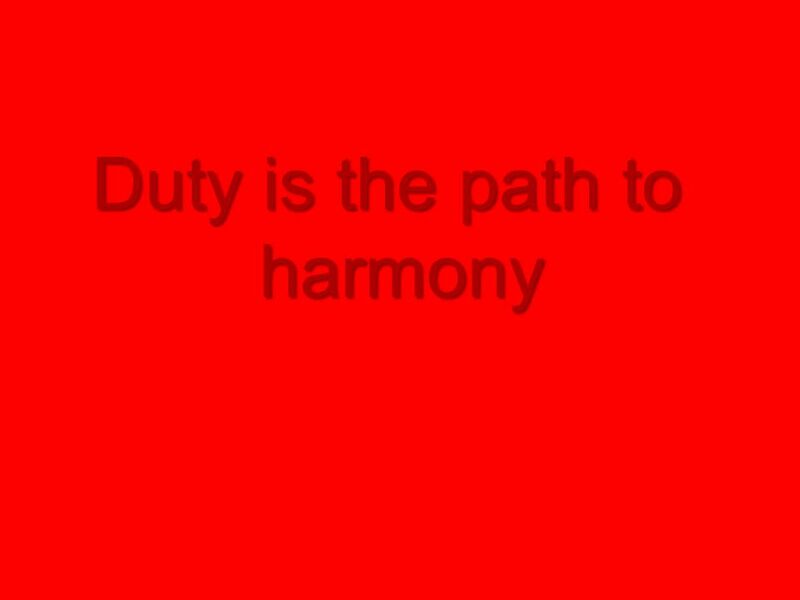 Harmony created if people follow the dao. Nonaction, simplicity, humility, quiet, plainness, and peace emphasized. 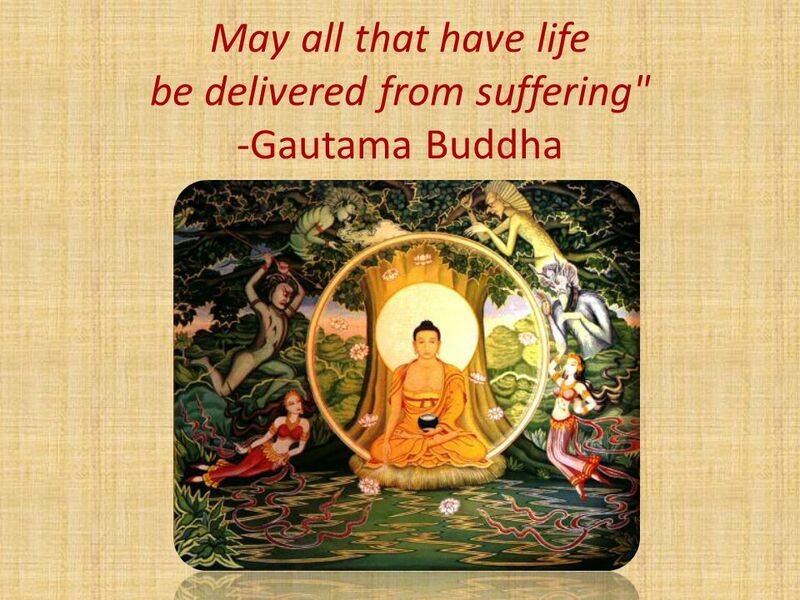 Nonaction, simplicity, humility, quiet, plainness, and peace emphasized. 19 Those who know, do not speak of it. 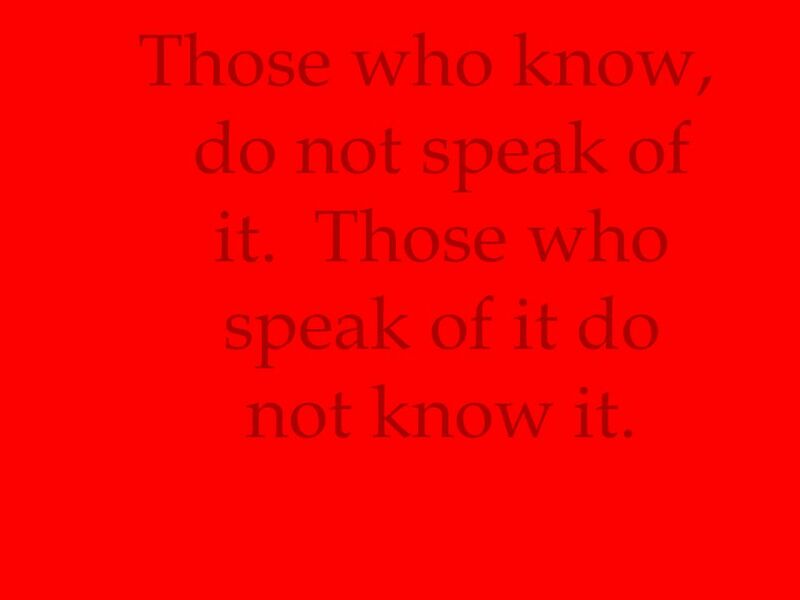 Those who speak of it do not know it. 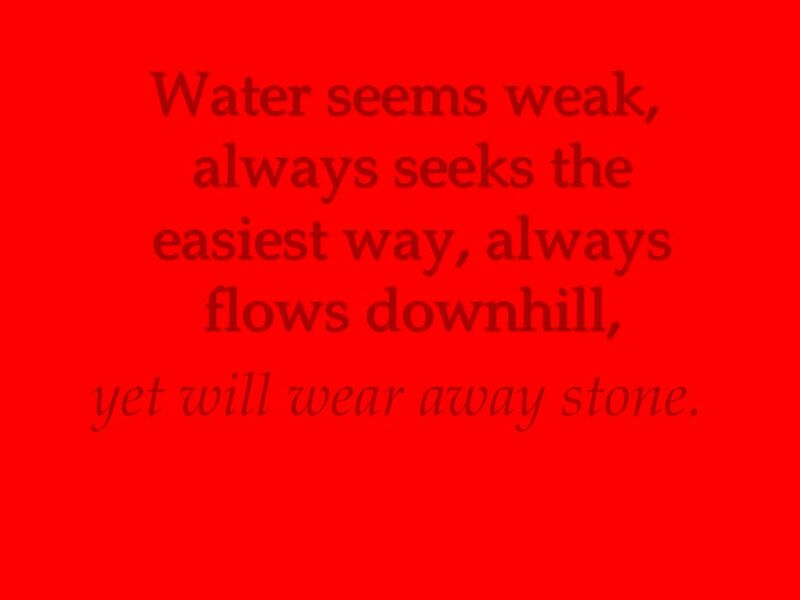 20 Water seems weak, always seeks the easiest way, always flows downhill, yet will wear away stone. 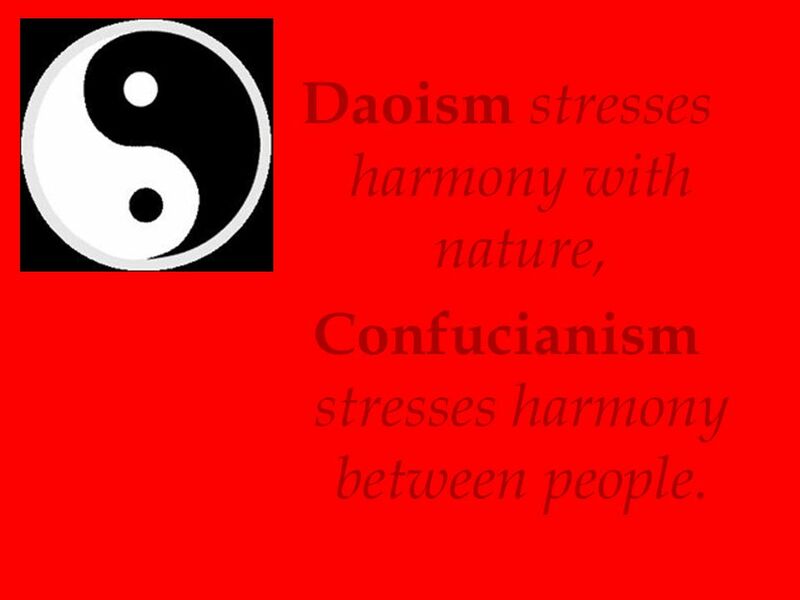 21 Daoism stresses harmony with nature, Confucianism stresses harmony between people. 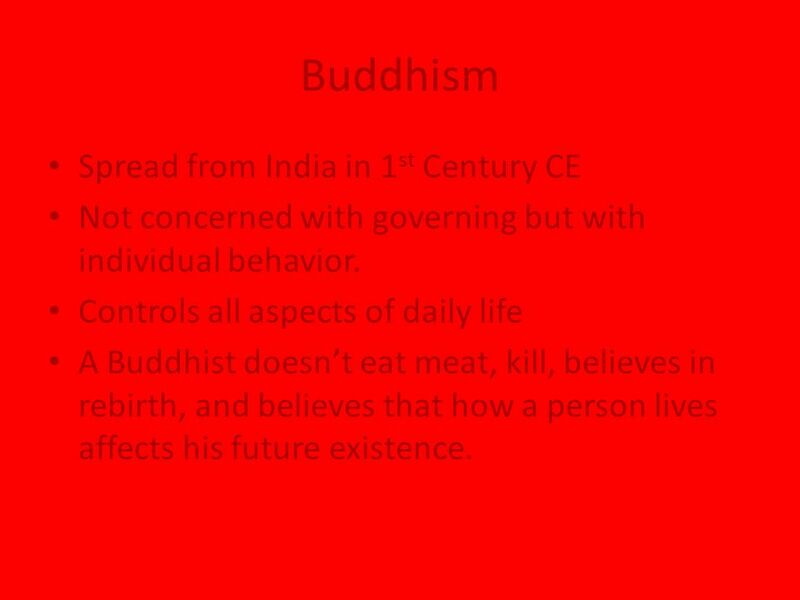 25 Buddhism Spread from India in 1 st Century CE Not concerned with governing but with individual behavior. 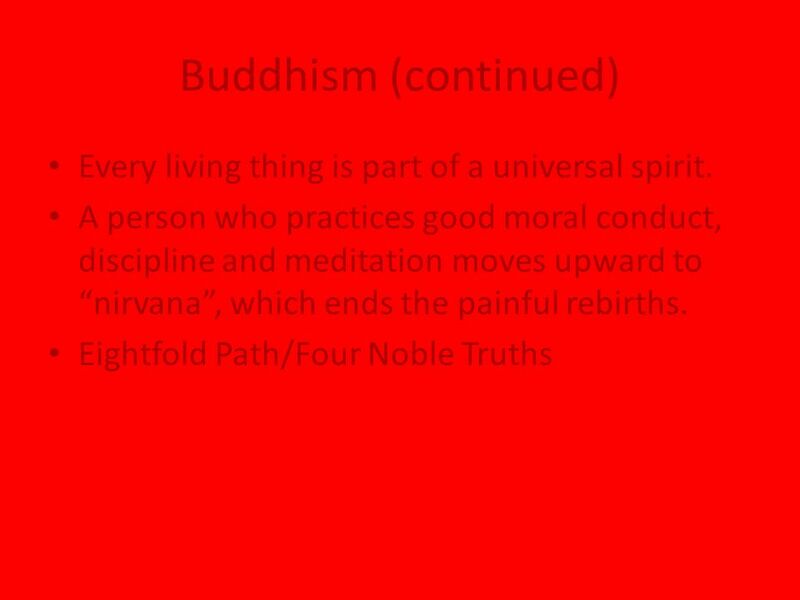 Controls all aspects of daily life A Buddhist doesn’t eat meat, kill, believes in rebirth, and believes that how a person lives affects his future existence. 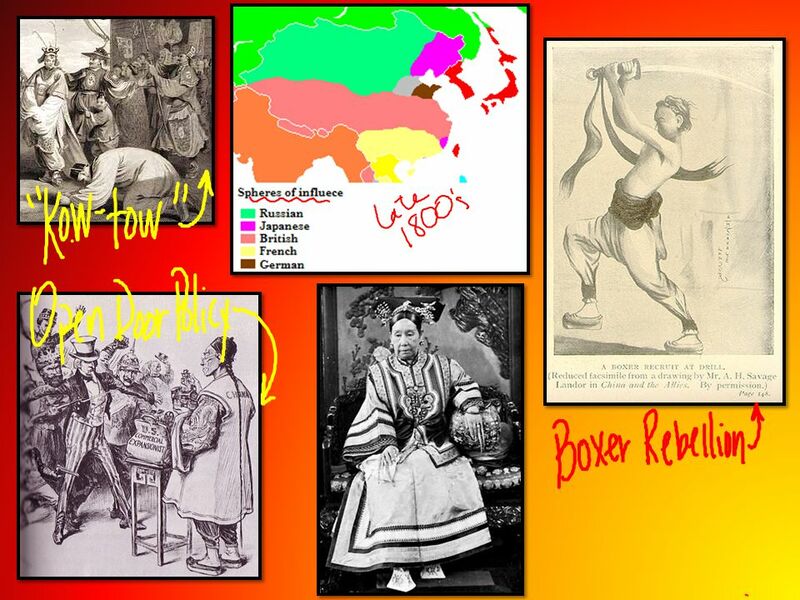 28 Over time, Buddhist beliefs blended with Chinese culture. 1. Nirvana became place similar to the western concept of heaven 2. 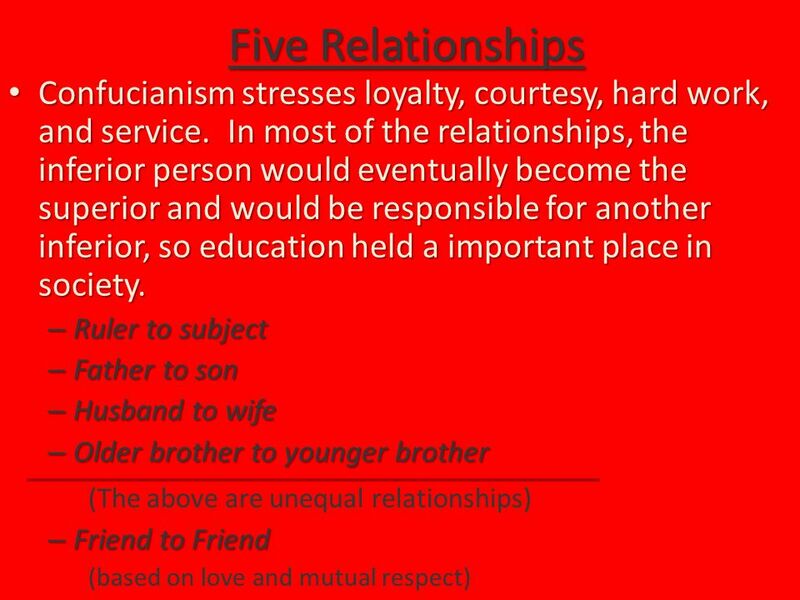 Confucian ideas of proper behavior and respect for family and ancestors 3. 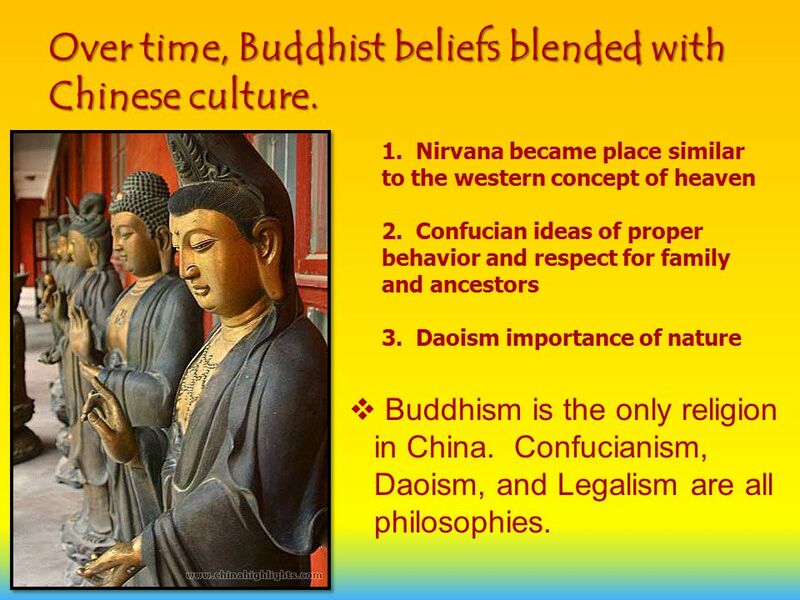 Daoism importance of nature  Buddhism is the only religion in China. 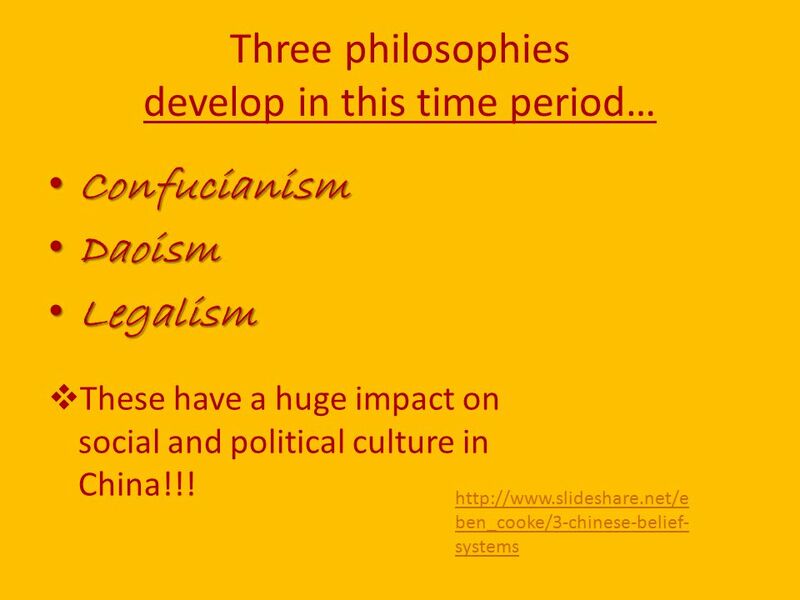 Confucianism, Daoism, and Legalism are all philosophies. 33 They developed the idea that the government should be run by the most talented and educated men. 1. 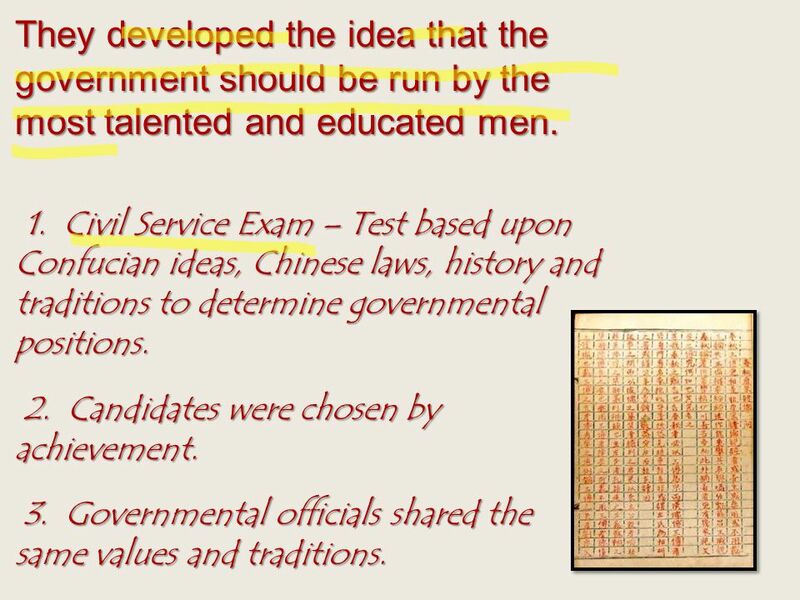 Civil Service Exam – Test based upon Confucian ideas, Chinese laws, history and traditions to determine governmental positions. 2. Candidates were chosen by achievement. 2. Candidates were chosen by achievement. 3. Governmental officials shared the same values and traditions. 3. Governmental officials shared the same values and traditions. 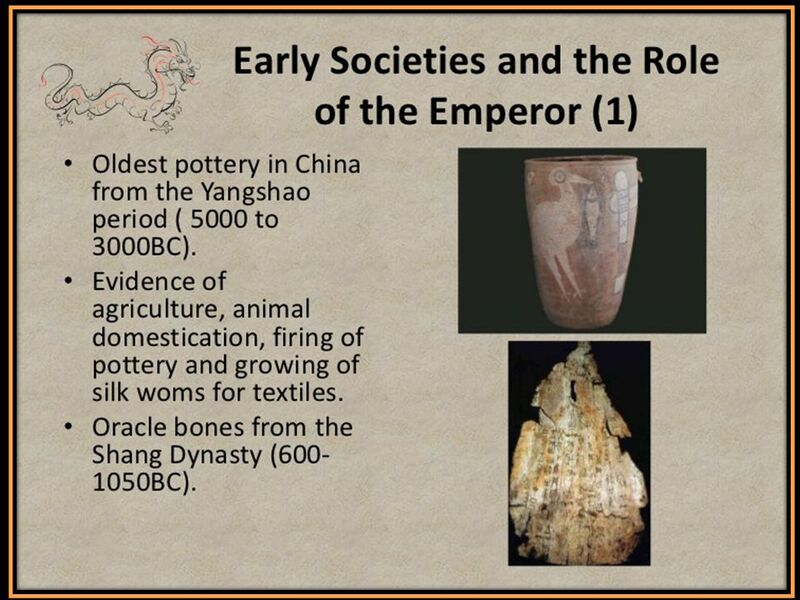 Download ppt "Oracle Bones – Priests would write questions from the rulers on sheep or goat bones. The bones were heated and cracked. The priests would then interpret."  “Beauty is in the eye of the beholder.”- Anonymous. Ideally this sentiment would be fascinating if it were true. Unfortunately, our concept of beauty. 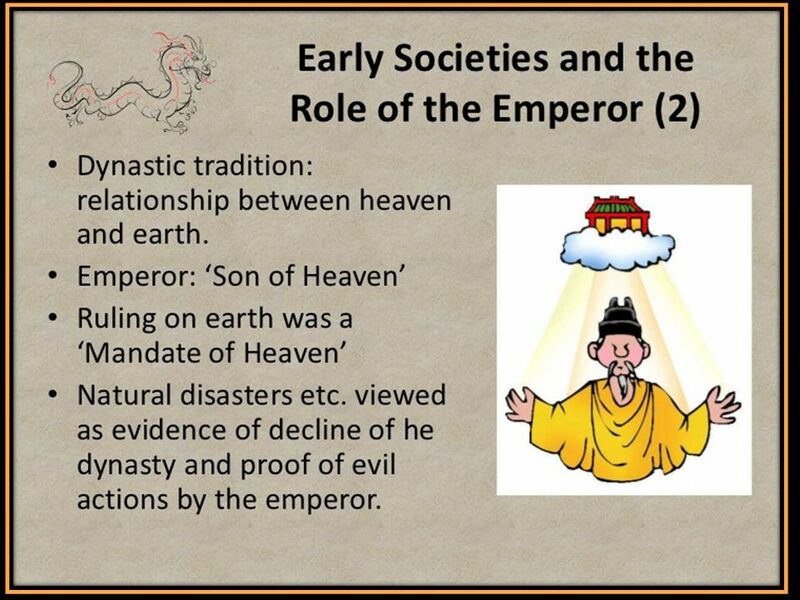 CONFUCIANISM With no CLERGY or GODS - Confucianism is not a religion in the TRADITIONAL sense ETHICAL system provides direction for personal behavior Practiced. 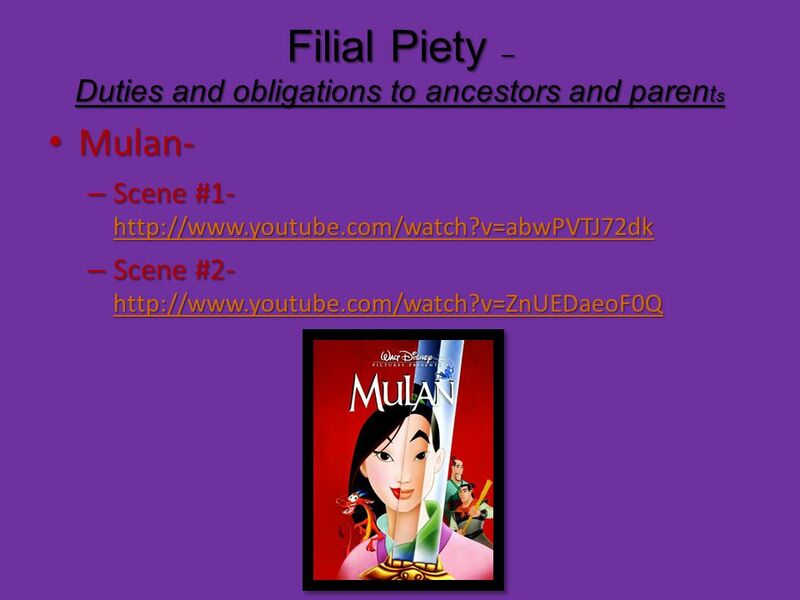 2 pt 3 pt 4 pt 5pt 1 pt 2 pt 3 pt 4 pt 5 pt 1 pt 2pt 3 pt 4pt 5 pt 1pt 2pt 3 pt 4 pt 5 pt 1 pt 2 pt 3 pt 4pt 5 pt 1pt Buddhism Qin, Han & Legalism Confucian. East Asia. 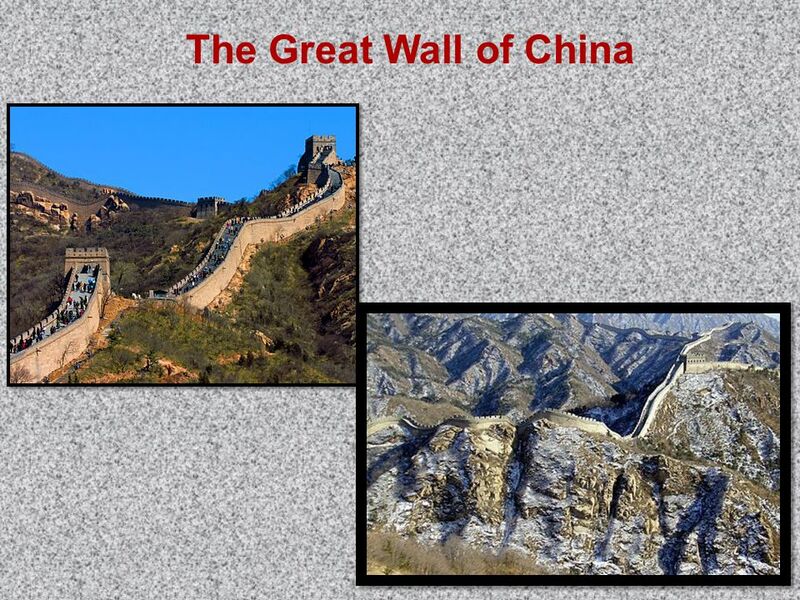 2 Relative Location Introduction –East Asia is the most populous region in the world –China is the most populous country, and the oldest continuous. 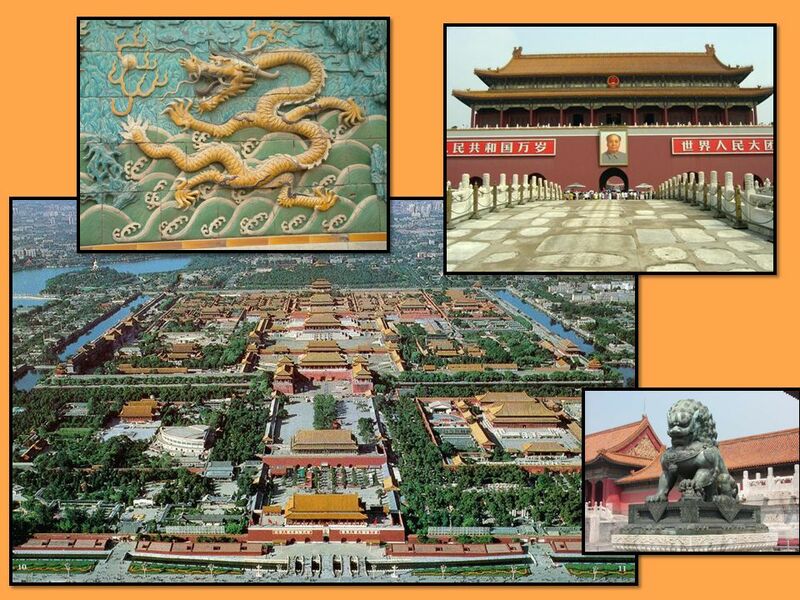 Chinese Belief Systems What are the belief systems of Ancient China? 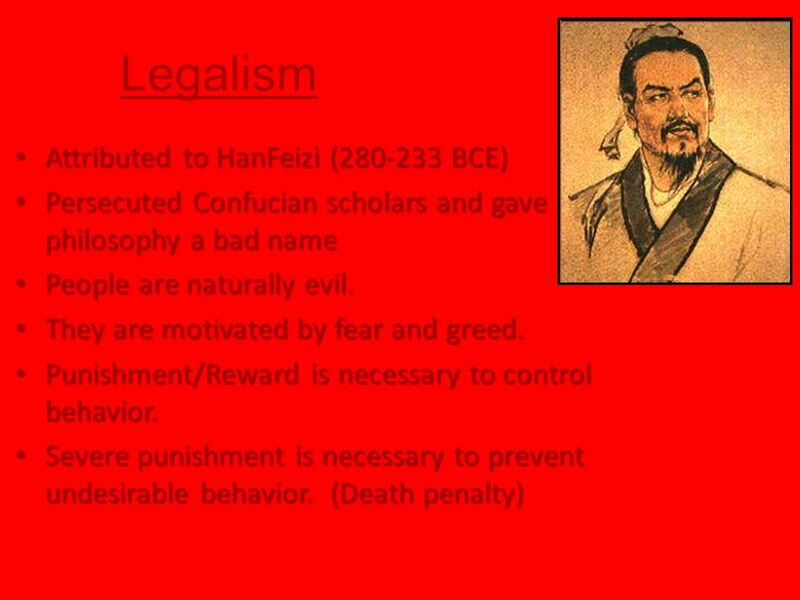 ConfucianismLegalismDaoismBuddhism. 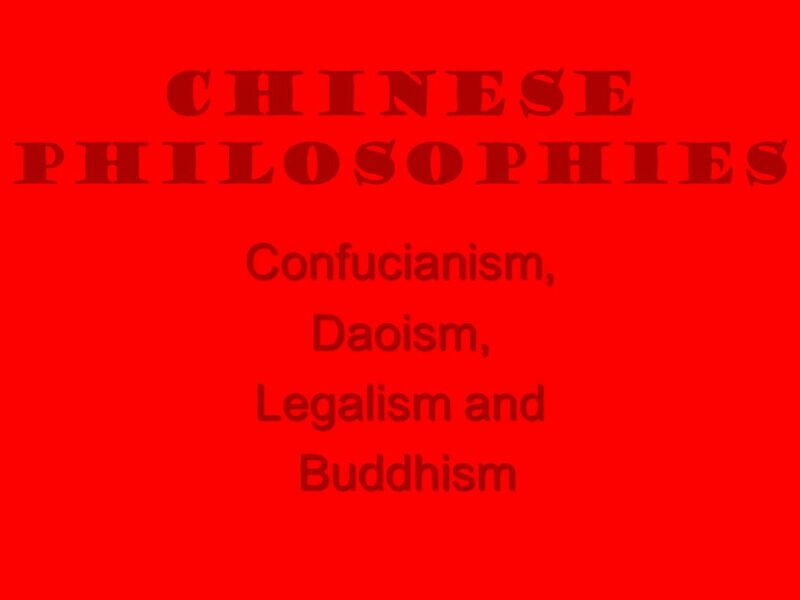 Chinese Philosophies Confucianism, Daoism, Legalism and Buddhism. 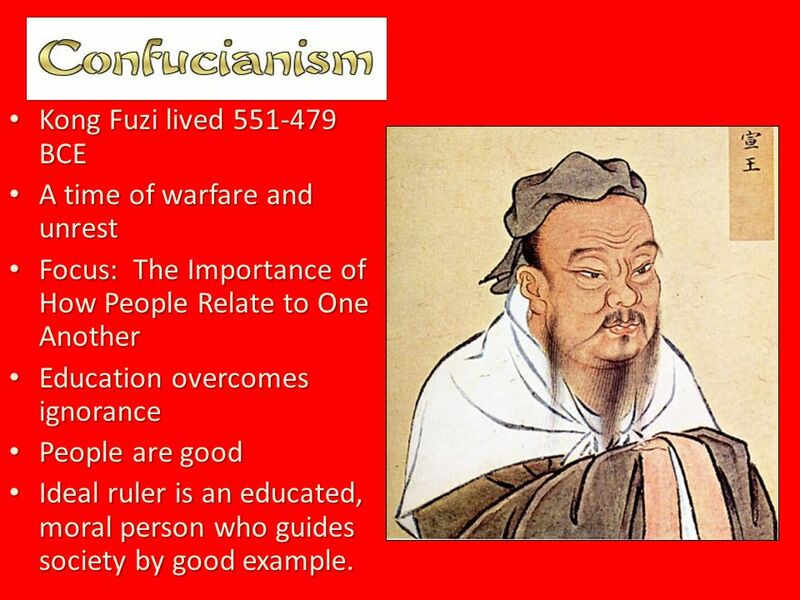 Confucianism Confucianism is an ethical system rather than a religion. 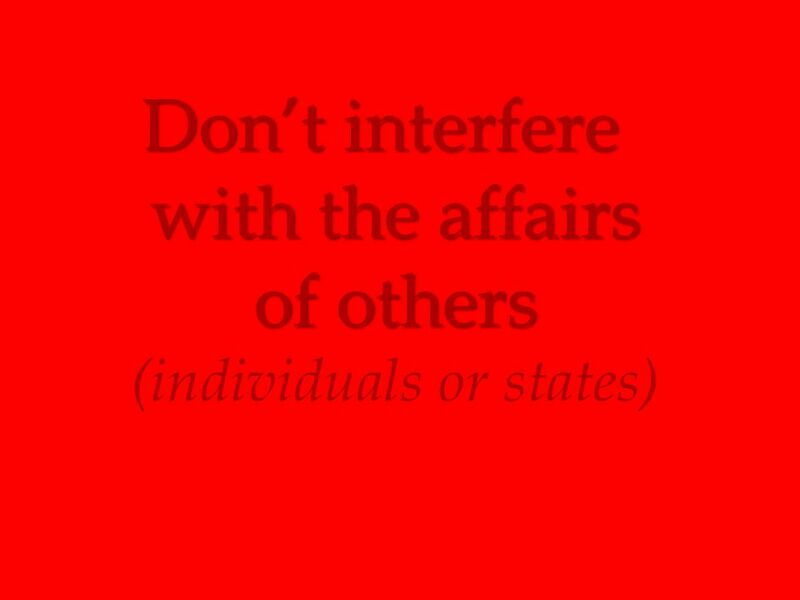 (Ethics deals with human behavior and conduct.) 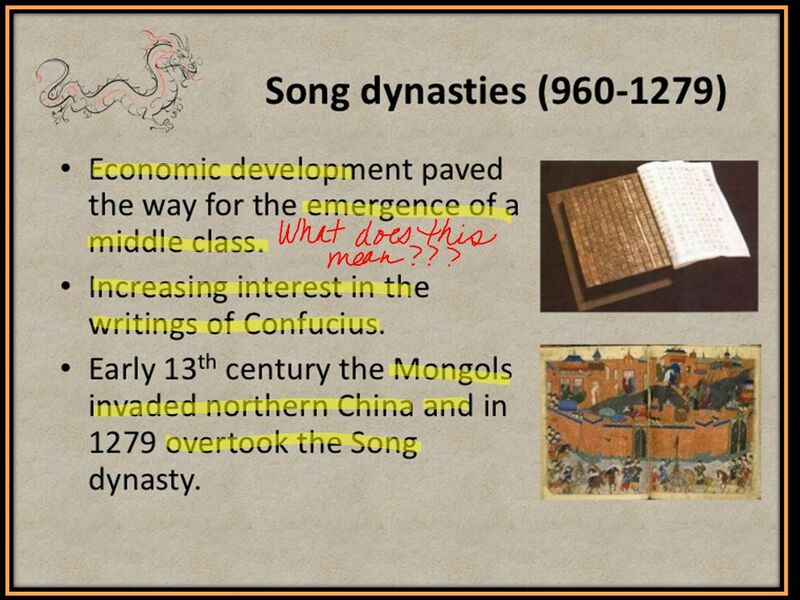 Confucius was mainly concerned. 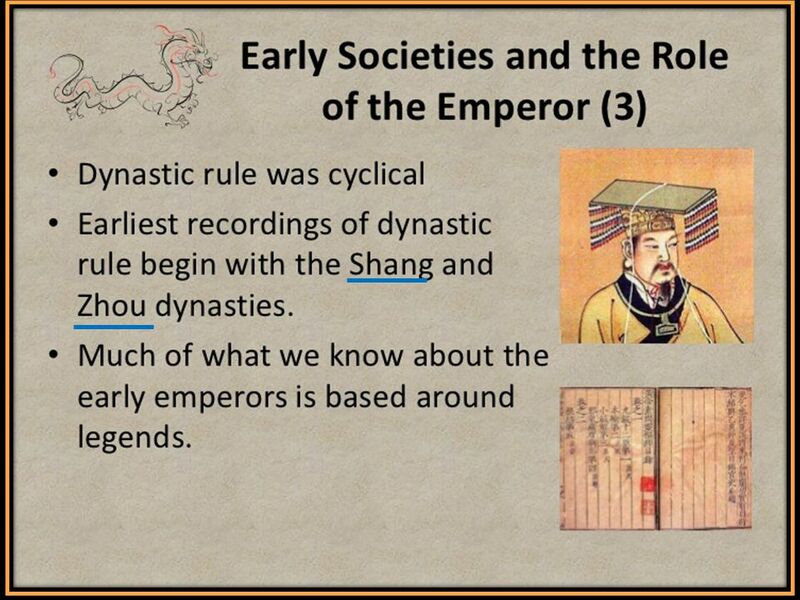 Three Chinese Philosophies The Zhou dynasty lasted from 1045 B.C.E to 256 B.C.E. 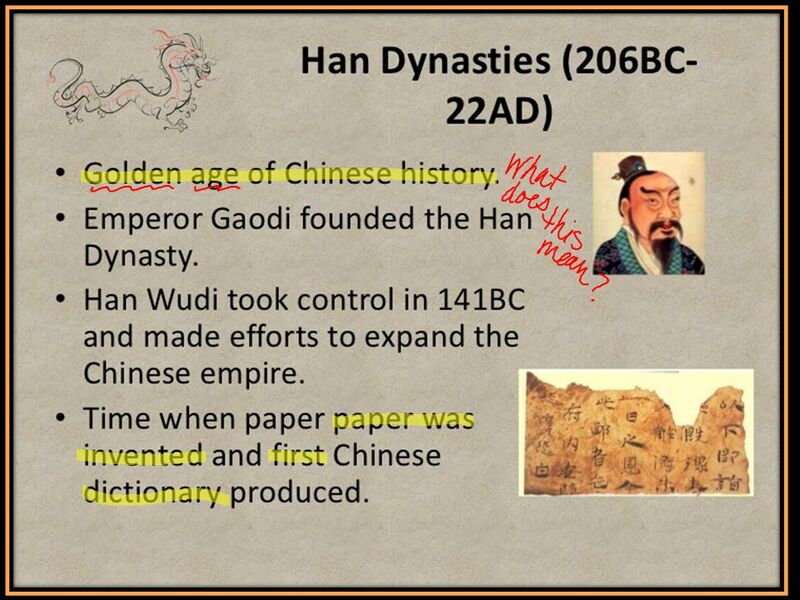 and different leaders fought for control in China. 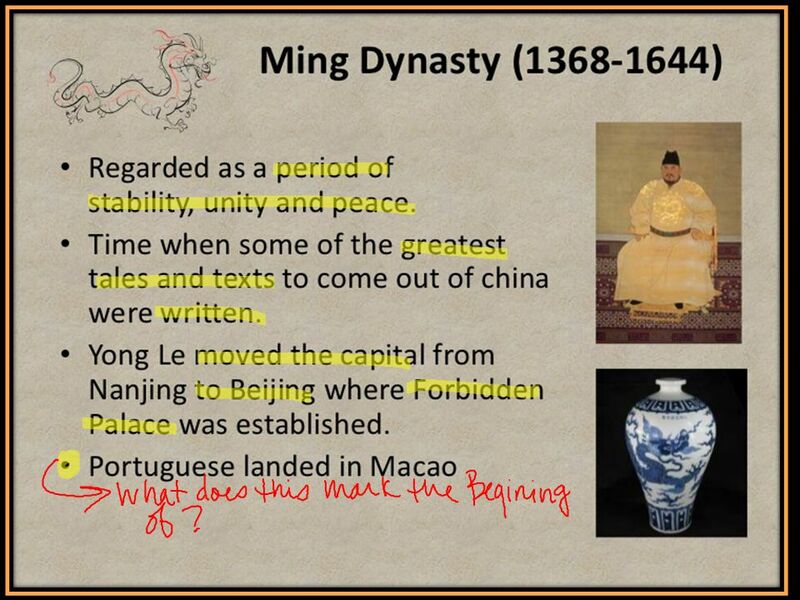 It made Chinese thinkers. I. Evidence of very early life in China Agricultural Rev. gave rise to civilization in China. 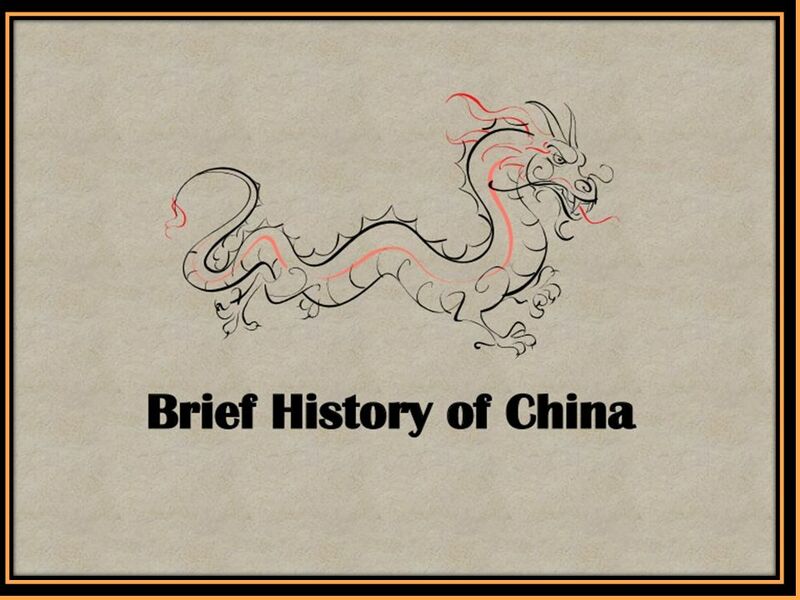  Confucius 551BC-479 BC  Confucius was interested in ways to organize a good society. 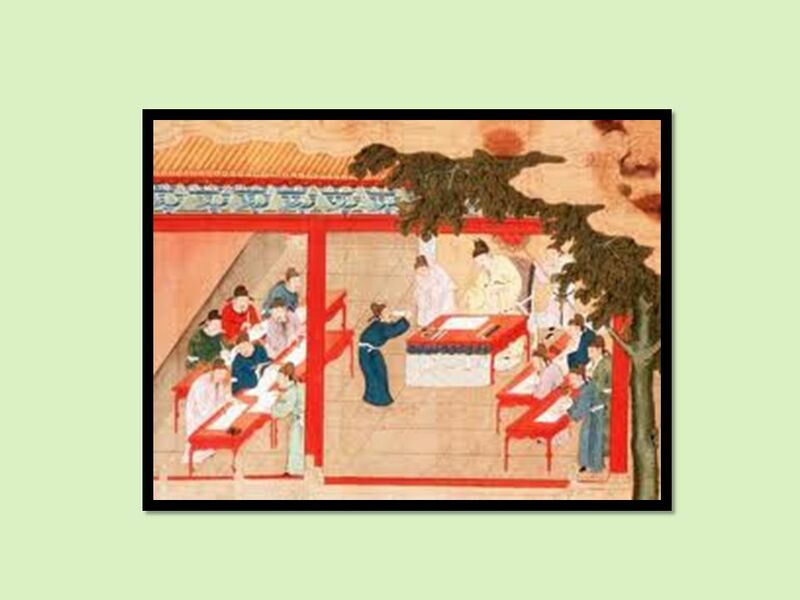  His teachings were collected into a book called the ANALECTS. 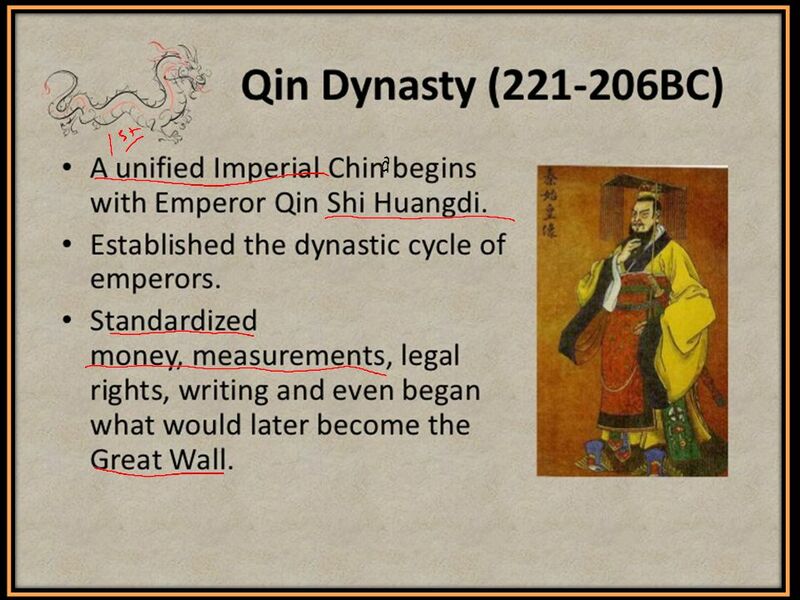 Heritage of China. 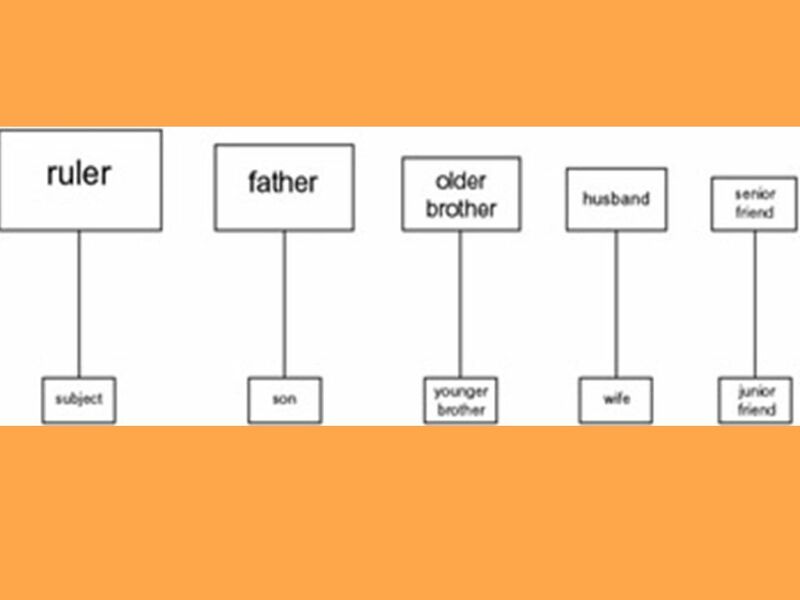 The Dynasty Having one family or group rule for an extended period of time. 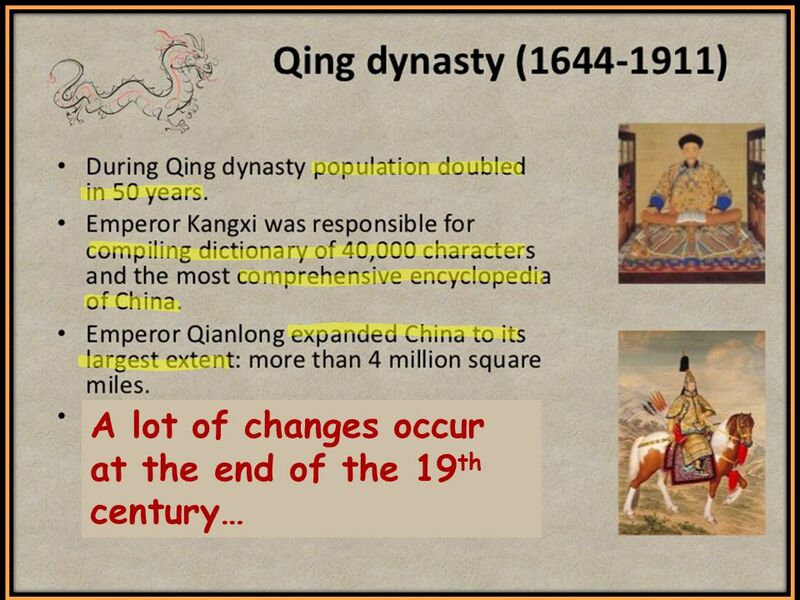 Zhou (joh) Dynasty lasted almost 800 years Rulers were. 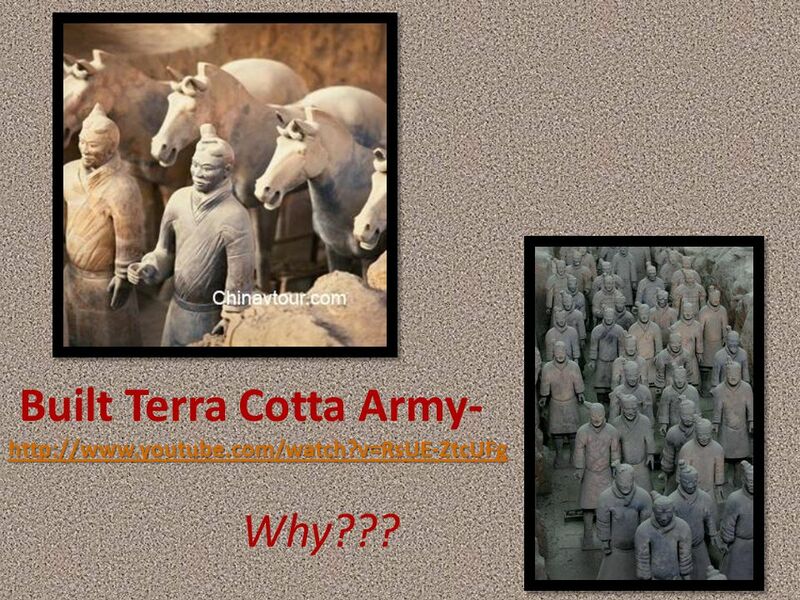 ETHICAL SYSTEMS OF CHINA The qin – han dynasty “I hear and I forget. I see and I remember. 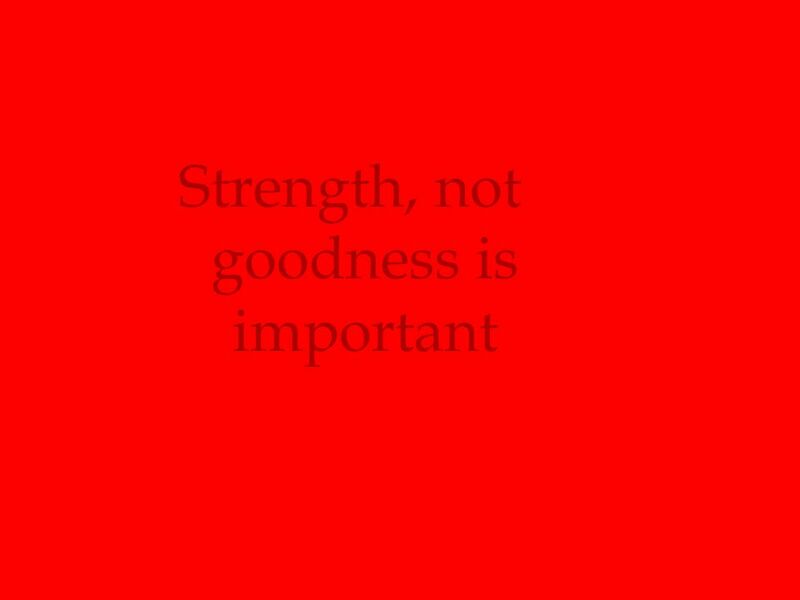 I do and I understand.” - Confucius Chinese philosopher & reformer.